Are there differences between swimming goggles which I should consider? What swimming goggles should I use for my triathlon swim? I get asked these questions and many more over and over from the beginner swimmers I coach. And no wonder, with the plethora of different shapes, types, lens colors and brands of goggles out there, it is a very confusing world for a non-expert. Usually, what tends to happen is that the first pair of goggles that you come across are the ones in your local supermarket's aquatics aisle not realizing that this is probably the worst pair of goggles you can find :). When you get to the pool, you discover that they do not sit properly on your face, they constantly leak and they fog up after a lap. I did touch upon some tips for buying your first pair of swimming goggles already in one of my previous swimming goggle posts, but it does not hurt to hear an opinion from another expert. This time I asked the actual professional swimming equipment seller WT Sports about what one should consider when buying swimming goggles and here is what came out of our discussion. 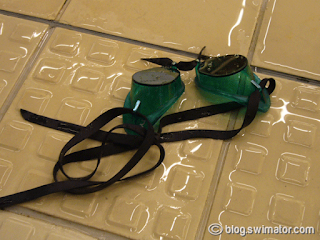 Picking the right goggles is a challenge many swimmers face. Despite it being such a vital piece of equipment to any swimmer, some don’t take the time to compare the wide variety of goggle types on offer, and subsequently just buy the first pair they see. When it comes to choosing which goggles are right for you, there are a few things you should consider: shape, lens color and type, and of course, price. Additionally, when assessing each of these elements it is necessary to think about what function the swimming goggles will be serving; e.g. competitive racing, training, pool swimming, outdoor swimming or snorkeling. Let’s take a quick look at each factor and make the decision process a little bit easier. Probably the most obvious factor in choosing goggles, the shape is vital to ensuring that you like how they look, and of course, making sure they comfortably fit your eye socket or face contours. Goggles come in all shapes and sizes, ranging from the small competition models to the full sized masks. The smaller pairs are usually designed with competitive racing in mind, and as such are designed to fit closer to your eyes and make you more hydrodynamic. However, this closer fit might cause some eyelash friction with the goggles for the individuals with longer eyelashes. Let's just say, it is a bit annoying to feel your every blink. On the other hand the mask-style goggles are built to serve a different purpose – for recreational use, or even snorkeling in the case of the over-sized models. In this way, they’re a lot larger and provide the benefit of increasing visibility – particularly peripheral vision. Those that don’t race often and just swim for recreation purposes may be more suited to the mask shaped goggles, as the smaller competition styles may become uncomfortable after prolonged use, and if too tight may create a case of panda eye! Also, the mask is easier to be fitted onto your face, so you are less likely run into trouble with water leakage. Depending on where you are going to be swimming, you’ll need to consider what type and color of lens you want on your goggles. 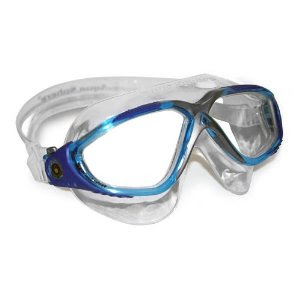 Clear lenses offer maximum visibility in dim lit areas and are particularly good for indoor swimming. On the other hand mirrored effect models are great for outdoor use, especially for reflecting light away from your eyes when the sun is bright! There are also lens types that make it easier to see around you when swimming underwater – usually orange tinted to enhance brightness and visibility. Some goggles are equipped with anti-fog lens technology, helping keep vision clear while you swim. You can also buy an anti-fog spray to maintain this and ensure your goggles are always protected from the fog, however, the most common and cheapest solution is to use your own saliva to lick the insides of the goggles right before your swim. The final aspect to consider when choosing the rights goggles for you is the price. Like with all buying experiences, you want to get the best value for money, and it can sometimes be a little confusing knowing how much to spend without risking getting a substandard pair of goggles. How much you should spend really depends on how seriously you take your swimming, and whether you feel a more expensive pair of goggles will benefit your swimming experience enough to warrant paying for them. Prices can range from £10 (15USD) to around £30 (50USD) in most places so even the better quality models won’t cost you a fortune. Having said that, the majority of cheaper goggles will prove to be satisfactory for the casual swimmer. Note from Swimator Blog: As you already know, it is not easy to choose. Bottom line is, the look of the goggles and the price is not the determining factor you should be focusing on in your choice. More expensive and great looking goggles might not necessarily be better suited for your swim than cheap and simple type. I have tested many goggles in my life, starting from suction cup types, foam type padding, masks and even some very old school Eastern European rubber eye contraptions. And after all those experiences, I have yet to find a better pair of goggles than the cheapest and simplest Swedish goggles. Swim with Swedish goggles. Of course, I come from the competitive background, so I don't suggest you go and buy these Swedish shells, but it at least gives you an idea how everyone is different. Please feel free to share your goggles experiences or disasters in the comments. 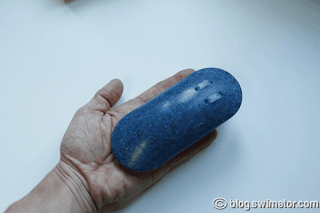 This post is long overdue, but finally I kicked myself to introduce you to the wonderful world of the Palm Paddle. I am not kidding when I say it is the world's smallest hand paddle. At first sight, the paddles are so tiny and cute that you just want to cuddle them in your palm :). Don't let the small size fool you into thinking that since they are so small, they have little to no purpose for swimming though. On the contrary, as someone famous once said "one small step for a man, one giant leap for mankind", we could say "one small stroke with the Palm Paddle, one giant leap forward in your swim technique". :). Many swimming technique articles that are out here in the darkest corners of the Internet focus on the early vertical forearm, the early catch or also called the high elbow technique for freestyle. And rightly so, without mastering this technique, it is tough to become competitive in your field of fellow swimmers or triathletes. However, what is often overlooked is what happens after the catch. Let's assume that you have a very good early catch, so you set yourself up for a great underwater stroke, however, after the initial catch your hand still slips through the water as if you are not pulling any water and you do not move forward as fast as you'd expect. So what happened? You did have a nice starting catch or in other words, you grabbed a hold of water or yet in other words, you found support in water with your hand and forearm, however, this hold or support disappeared as your stroke progressed. Basically, you lost it somewhere along the underwater stroke. Chances are your hand was not moving in a straight line driving back and deviated quickly to one side causing it to cross under your body and lose your grip on water. Don't despair though, this is very common among swimmers and the Palm Paddle is here to help. The Palm Paddle is not designed to be put on as a regular paddle would where you'd slip it on your middle finger(s) all the way to the knuckles and then perhaps use another strap to attach it to your wrist. No no no, it only slips on your middle finger passed the first finger joint, so it only hangs on the tip of your finger. This delicate attachment makes sure that if your hand deviates from the straight underwater pull path, the paddle will slip from your hand. Thus causing you to be extra careful with your hand trajectory and teaching you to follow the path were you retain the initial grip on water which you got from the high elbow catch. Isn't it cool? A paddle which will teach you how to properly run your hand through your stroke. Simply amazing. And don't worry, they float, so you won't lose them if they fall off:). Of course, this is not the only benefit of the Palm Paddle, but it is in my opinion the main one. After you master the underwater pull without loosing the paddles, then you can start discovering the other benefits which are of the "antipaddle" nature. Basically, it makes your hand feel desensitized for the period of time when you swim with the paddles and when you take them off you are better equipped to feel the water in the palm of your hand. 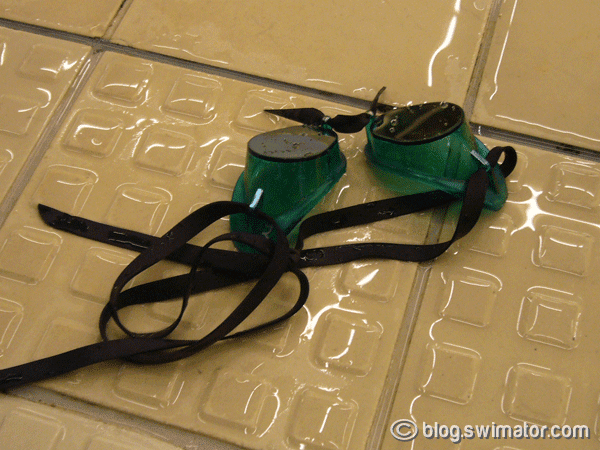 Along a similar idea, since you swim with them, the conical shape makes you actually pull less water, so if you are in a lane with slow swimmers, just put on the paddles and voila, you no longer need to pass the slow pokes since you swim with the same speed while working on your technique or increased stroke rate tempo. Also, if you are recovering from a shoulder injury or surgery, you can use these paddles to lessen the water pressure since your hand slips through the water easier. Another benefit is the small size. 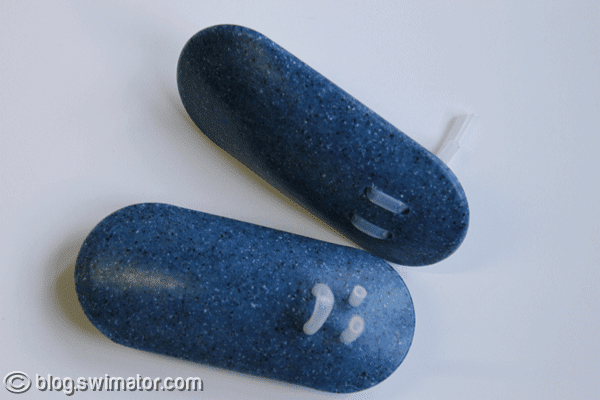 I no longer carry a huge swimming mesh bag with me to practice, I just stick these world's smallest paddles in my pockets and go :). If you are in open water, they can be easily slipped into your swim suit or wet suit for safe keeping while you swim without them. Or if you have already discovered the benefit of using the Safer Swimmer safety device they don't take much space at all, therefore, leaving you a lot of free room for other necessary items you'd like to take with you for a swim. So, go out there and improve your underwater pull, so you can enjoy the benefits of fast and easy swimming. On another note, if you are still on a hunt for a great swimming related Christmas present, the Palm Paddle or "trilobites" as my swimmers call them :), could be your lucky Christmas winner :).